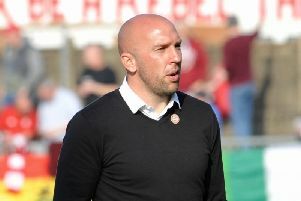 ​Lancing manager Mark Pulling was disappointed with his side’s 3-1 home defeat to Lingfield and said the players ‘need to have a little look at themselves’. Jake Horn opened the scoring for the visitors, and two late goals from Naseem James sealed the game for the visitors. Midfielder, Jonathan Lansdale scored in injury time for the home side, but it only proved to be a consolation. The hosts were reduced to 10 men, when Jack Langford was shown a straight red card. Pulling said: “It was disappointing because we lost, obviously, but I’m more disappointed with the performance as a whole. “Also, I think the players need to have a little look at themselves and decide when they are going to step up, because if they don’t come to training, then there’s an issue with the effect of the performance. “It’s hard because everyone has got to work and other commitments, but when they all turn up to training and they’re working hard in those sessions, then the performances reflect that. The defeat at the weekend leaves the Lancers 14th in the SCFL Premier after 13 games. They will face Loxwood on Saturday, who have appointed a new manager in Alex Walsh. Pulling added: “That’s the second or third time that has happened to us before we have played a team this season. Langley appointed a new manager before we played them. Lancing: Porciatti, Hendy, Di Arienzo, Bygraves, Lansdale, Pulling, Momah, Tredrea, Langford, Daniel, Lewis. Subs: Tighe, Pittock, Nagle.